Happy 10 Year Anniversary, Threadless! I recently received a package from Andrew of Atslopes, and inside were some TMNT goodies. I am a fan of the Teenage Mutant Ninja Turtles, so opening this envelope was like opening up a very early birthday present. 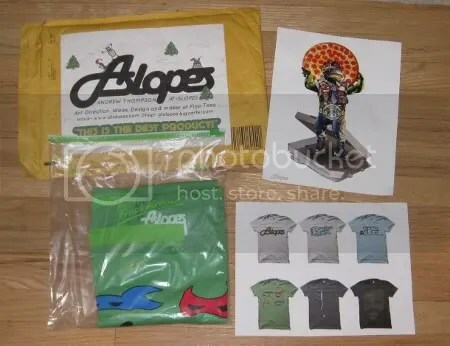 The contents included a Ninja Turtles t-shirt, a print, and an Atslopes line sheet. I’d also like to add that I love the image glued onto the envelope. SkiFree was such a fun game to play back when I was a little kid. The shirt came in a Hefty bag, which I found to be kind of strange. I like the fact that there’s a protective bag for the product and I see that the colors on the bag match the color of the tee, but zipper bags used for food storage just don’t do it for me. If anything, I am slightly put off by this. A note to t-shirt companies: If you want to put a shirt in a bag, make sure that it either has your branding or no branding at all. I personally don’t want to link your brand to a common brand that I see in every grocery store. It takes away from the specialness. Is that just me? 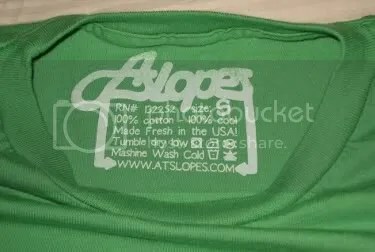 Atslopes t-shirts come with custom printed care tags. If you’ve read my other reviews, you’ll know by now that these are my favorite. They make the t-shirt look more professional, and you don’t have to worry about annoying tags. The design is printed on American Apparel, so the shirt quality is great as well. In comparison to the online mock-up, the ink colors are similar to how they appear on the screen except for the orange. While the orange appears to be a golden rod color on the screen (could just be my monitor), it’s a more rich, bright orange in person. I actually prefer this to how the color looks in the mock-up. Another thing that I’m noticing is that the blue isn’t a nice even layer on the shirt. I’m not sure if it’s this specific t-shirt that I have in my hands or if it’s all of the shirts, but the blue appears slightly speckled, with some areas being darker than others. If there’s one thing that I would fix for this shirt, it would be this blue layer of ink. Luckily, this isn’t obvious from a distance, so it’s not so bad. In conclusion, I’d like to thank Andrew of Atslopes for hooking me up with this t-shirt! 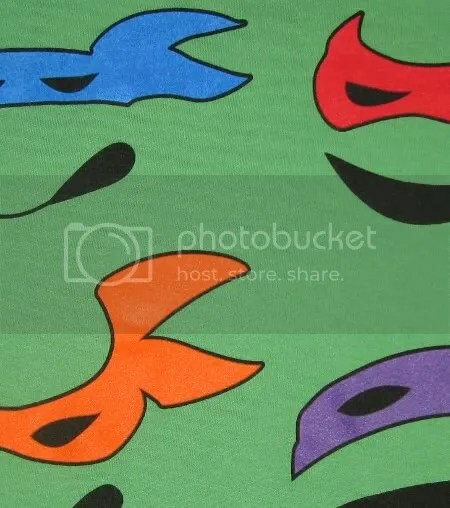 Although there are some things that I would change, I would still recommend this shirt to fans of this classic cartoon. 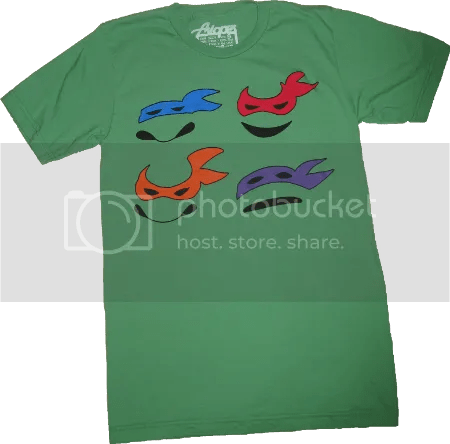 This Ninja Turtles tee is available for purchase at Atslopes for $17. For a limited time, you can also use the coupon code “Brooklyn” for 15% off.